PB&J may be a classic kid favorite, but let’s face it, eating the same sandwich day in and day out becomes a bit boring even for the most avid of PB&J lovers. Besides, more and more schools are becoming nut free in an effort to protect kids with allergies. So we all need some new school lunch inspiration from time to time. 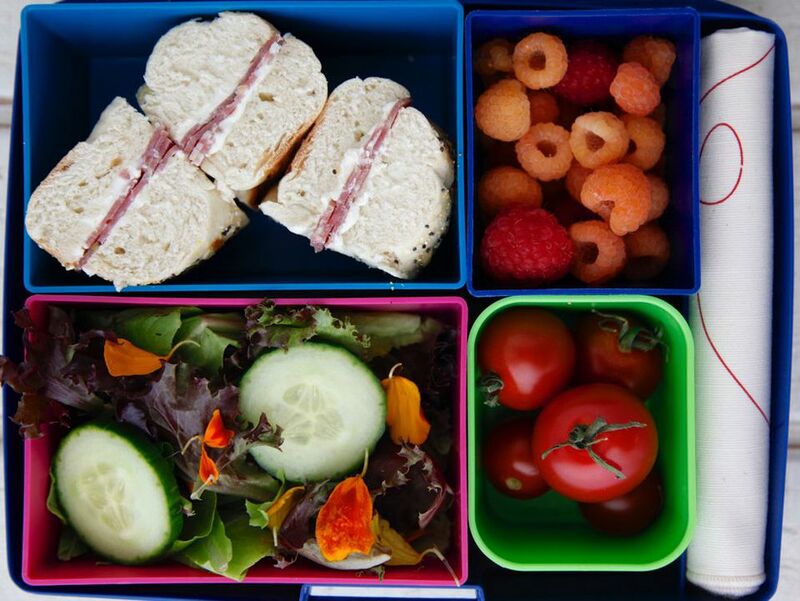 Check out these school sandwiches kids will love to help you offer your family healthy, filling, and delicious school lunch options that will keep them happy and...MORE excited to open their lunch boxes every day. 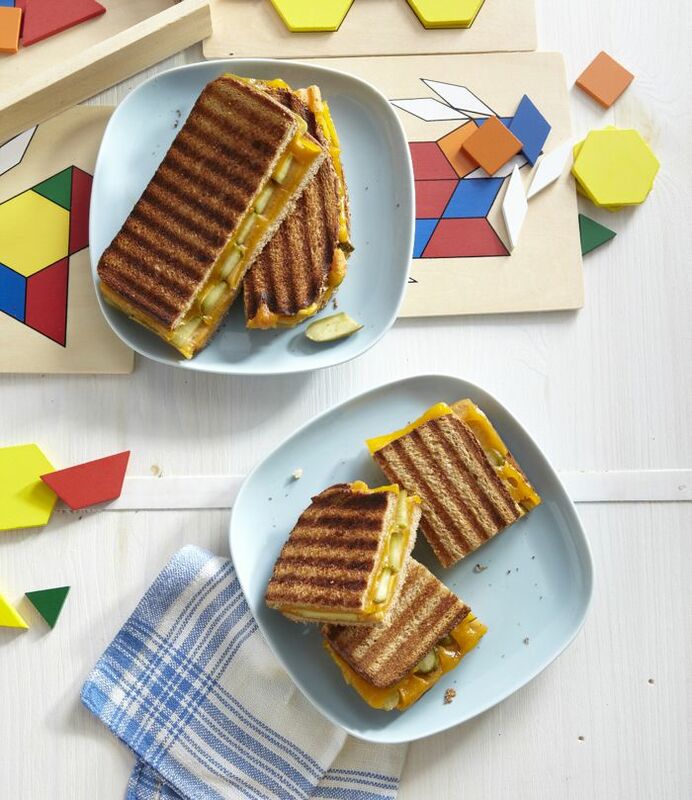 We often buy hearty whole grain sourdough bread and sharp cheddar cheese at the farmers' market to make paninis. Sometimes we would add a slice of heirloom tomato or avocado to jazz them up, but one weekend we were asked if we could just use pickles. Pickles. Not as a garnish to accompany the tomato and avocado, mind you, but as the sole co­star to the cheese. It sounded so silly that we all started giggling, "grilled cheese and pickle?" So we tried it out, and we all loved it! Benedictine was a traditional recipe we ate a ton as a kid and now keep on repeat at home. We love that a Benedictine sandwich is a bit more exciting than your usual cucumber cream cheese sandwich with a few other interesting ingredients, but it's still simple to prepare and the filling keeps in the fridge for a week. What’s not to love about a recipe that only uses three ingredients, takes two minutes or less to prepare and looks like such fun? If you’ve never tried them before you have to make banana dog bites. Even though there are only three ingredients, there are tons of variations you can use. We like using spelt or half whole wheat half corn tortillas, but you can also use all white flour tortillas or something with seeds inside. The most important part is getting something that’s really flexible. Using lavash is a fun idea too! We're sure there are plenty of parents with "picky eaters" who could never imagine their culinary­ challenging kids eating a veggie sandwich overflowing with crunchy cucumbers and carrots and slathered with luscious hummus and pesto, but we've got two kids who consistently surprise us when they devour this sandwich (which is so veggie packed we should really call it a salad on bread). It's full of nutritious foods you want your kids eating and a perfect sandwich for all those budding vegetarians in your life since they can get protein, carbohydrates, and their vegetables all in one place. Not to mention it's incredibly filling and tasty. Everything tastes better on a stick! So we recently bought a bunch of wooden skewers to thread all kinds of kids favorite foods. If your child is a sucker for tomatoes, cheese, french bread and Romaine lettuce, this way they can take the pieces off one by one and turn them into any combo they want or stuff everything in their mouth at once which we've seen happen too. We like to serve a dip on the side to dunk everything in as well. This salami cream cheese bagel bites sandwich was created by our meat­-loving daughter. If I ask her on any given day what she wants for lunch, a snack and sometimes even dinner, it’s salami. Even when she was a new eater and had a piece for the first time she fell madly in love and couldn’t get enough. We literally had to take it away from our then toddler. It’s a good thing you can find organic and minimally processed brands of salami because we eat our fair share. She usually eats it on its own, but when she asked for it in her beloved bagel and cream cheese sandwich recently I thought it was a fun idea. It adds a really good texture and flavor in the way topping a bagel with smoked salmon would have. Every year we try to come up with a list of new recipes for school lunch and these turkey cucumber roll-ups are a sure-fire winner. Since there’s no bread in them you can offer them to gluten­-free kids as well. With just a slice of turkey rolled up with cream cheese and cucumber slices they’re simple to prepare, travel well inside a lunchbox and are easy finger food for busy eaters. Serve them with your favorite cheese, some strawberries, olives, and trail mix and you’ve got a delicious meal! Not only is it a ton of fun to make cauliflower crusted grilled cheese and watching a head of the cauliflower turn into slices of bread, but my family totally devoured these sandwiches. Trust me when I say you don’t need to be gluten-free to enjoy the no­-bread sandwiches. They’re made with nothing but whole ingredients and taste like something really special. Chicken pesto wraps are the perfect way to use up all your leftovers and add something nutritious to school lunch. You can use chicken that you cooked for Tuesday’s dinner, those bits of pesto that you have in the fridge or freezer, and any vegetables you have on hand. Wrap everything up together in your favorite tortilla or sandwich wrap and you have a portable sandwich that will keep you and your kids satisfied until dinner!